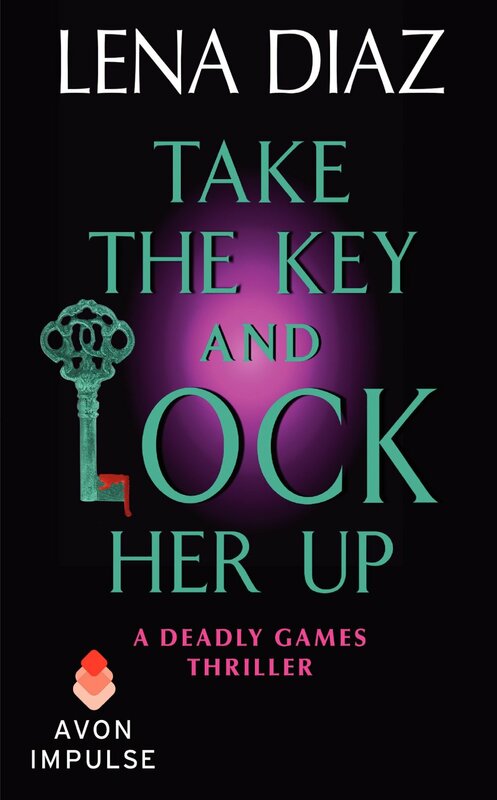 Posted on August 5, 2014, in Author Spotlight, Lena Diaz and tagged Assassin, Avon Impulse, Buchanans, Deadly Games, Detective, Devlin "Devil" Buchanan, EXIT Inc., Lena Diaz, release day, Romantic Suspense, take the key and lock her up, thrillers. Bookmark the permalink. 47 Comments. A favourite of mine is the J D Robb (aka Nora Roberts) ‘In Death’ series. There is something very special about a beautiful female cop sorting out the thugs and villains! Thanks for stopping by, Quantum. I know tons of people who love the In Death series. I still haven’t taken the plunge because I want a new couple, a brand new romance, in every book I read. Maybe one day I’ll give it a try. I do hope you try my series and that you enjoy it! I love the JD Robb series, too, Quantum. I love seeing how one couple grows in their love as they navigate a harsh world. I also love kick -a** heroines. Lena, you should give it a try and Quantum, if you love those books, I know you’ll love Lena’s too. Thanks Diana. I keep telling myself I’ll try that series but I have so much queued up to read! Happy release day, Lena! I really like Laura Griffin’s Tracers series because each book features different scientists from the Delphi Forensic Center and uses science to solve a puzzle mystery plus a steamy romance. Fantastic combo imho. Hi Krista! Thank you. Release day is always exciting. I agree on Laura Griffin. Have only read one book so far but it was full of action and I really enjoyed her writing style. Happy release day, Lena!!! Hope your day is a blast! I’m really enjoying Elisabeth Naughton’s new Aegis Security series. Thanks Rachel! And wow about Aegis! Kay Thomas had a series about an elite ops team with Aegis! That’s two authors who named their forces the same. We really do all think alike! *HAS* a series, not HAD. 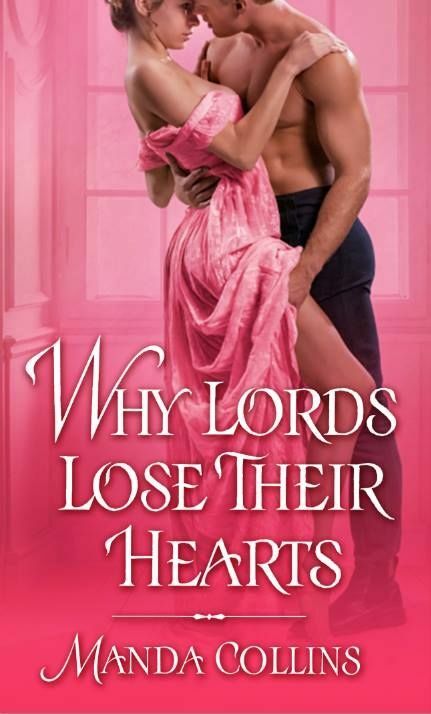 Kay just released book two. Congratulations on another fabulous book, Lena. I’ve enjoyed meeting the Buchanan clan and the wild adventures in the Deadly Games series. Love, love YOUR books! Oh LENA! I am flying through Chapter 5 (took a break to visit here) and I LOVE IT!!! I knew Devlin would be my favorite Buchanan brother…you really pulled it off. Congratulations and I wish you a straight shot to the NY Times Best seller list. Happy release day! Off to FB. Coming from you that is a high compliment! I’m so glad you like Devlin! Thank you Sarah! Thank you Gwen! Devlin was so hard to write. I hope I did him justice. Happy Release Day, Lena!!! I am so excited for you and I have packed up this book to take to Jamaica with me next week. Can’t wait to read it on the beach!!! My bff, Lark would say JRW too. She’s read everything and quite a few by Jessica Bird. Yay! Dev and Em will love the beach. And I’m with you on vampires. LOVE Sherrilyn Kenyon’s Dark Hunters. I was lucky enough to win a copy of He Kills Me, Be Kills Me Not a year ago and that started my love of your books. I immediately bought the next 2 and have Take The Key and Lock Her Up on my wish list. I also follow Laura Griffin’s Tracer series and Allison Brennan’s Lucy Kincaid series. Emily March/Geraldyn Dawson had a series about the Callahan family I really liked. There were 4 brothers I think. Thanks for the chance to win . Hi TrishJ! I’m so glad you enjoyed my books. Thank you. And Allison Brennan’s book are great. Definitely agree with you! Trish, my God, you are a series QUEEN! I envy you the time to read all of them too. Happy release day!! Hmm…I like to follow the Buchanans and the Deadly Games series. YOU are an autobuy for me. I cannot wait to crack this book open. Congratulations, Lena! So excited to read this one! As for series, there are so many I follow. One of my favorites though is Laura Griffin’s Tracers. 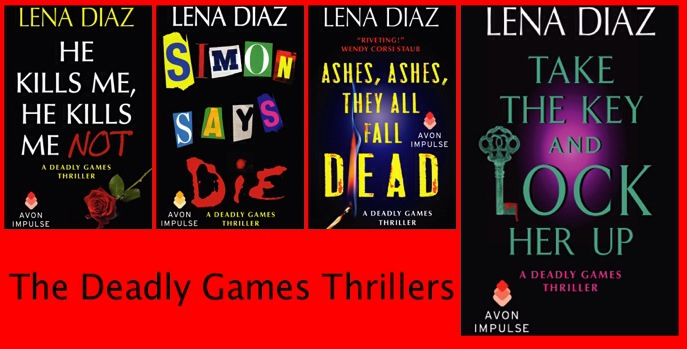 And there’s this author called Lena Diaz who writes these awesome romantic suspense books! Love her! LOL! Did you and Carey team up to say that? Thank you so much Manda! Oh! I was so SURE she’d say Will Trent and copy ME! Hmmm…. let me see… which series is my favorite? Could it possibly be the Deadly Games series? Loved it even when we called it Nursery Rhyme …. and will continue to love it no matter what they call the series! The Buchanan brothers (and their step dad) rock! Their women are some of the strongest ever written. Hi Julie! So good to see you here. Thank you so much for your support. Thank you so much Carmen! Swoon worthy is an awesome compliment for Devlin, whom I adore! wanted too give a quick shout ouut and tell you I really enjoy reading your blog posts. same topics?Thank you so much! I’m not sure wwhy but tthis sitte is loading incredibly slow for me. I’ll check back later on annd seee if the problem still exists. I don’t eve know how I ended up here, but I thought this post was great. something which I think I would never understand. It seems too complicated and very bropad for me. My brother recommeneed I would possibly like this web site. day. You cann’t imagibe just how much time I had spent for this info! To avail these online directories, one can search it by location, by industry, by category or by specific business area. exuding professionalism and showing them that you actually care. There is a tendency for many people to submit mirror site. The expected normal turn around time is 2 business days in the industry. the customer that you are a real business. You may find many of these useful to use in conjunction with Numbers Templates. insurance policy strategy is administered by Delta Dental Insurance policy Company. Company as well as Dentegra Insurance Company of New England.